Are cryptoeconomics and economics of tokenisation (tokenomics) the same thing? Short answer: No. Tokenomics is a subset of cryptoeconomics. Cryptoeconomics is about building systems that have certain desired properties. It uses cryptography to prove properties about messages that happened in the past and economic incentives defined inside the system to encourage desired properties to hold into the future. Economics of tokenisation (aka tokenomics) designs the tokens in a token ecosystem. It considers 3 design variables: market design, mechanism design and token design. Well designed economics with rules and incentives, defines the long-term outcomes of cryptoprojects. Poorly designed ecosystems can lead to the collapse of the ecosystem. 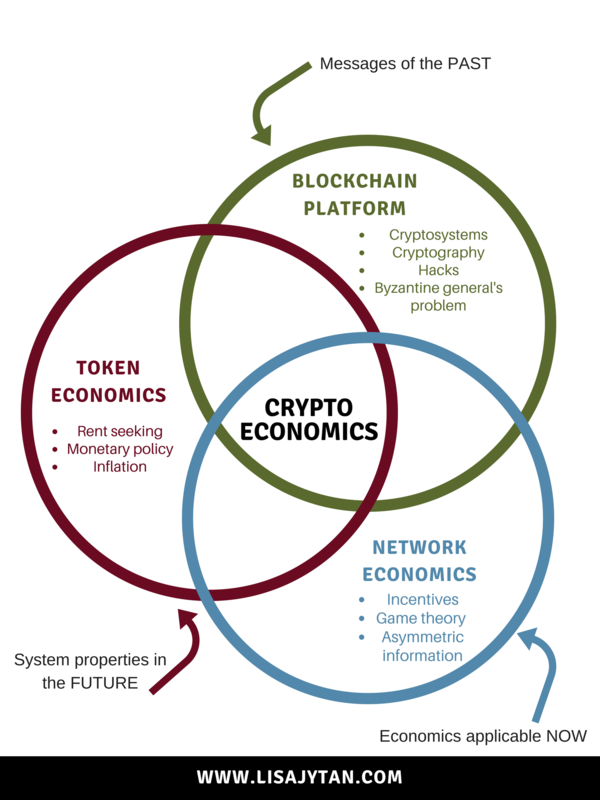 Tokenomics is a subset of crypto economics. It is the economics of the token; aka the crypto project/DApp. It does not include the cryptosystem (aka blockchain technology like ETH, NEO, NEM). Ps: It’s economics of tokens. Not Token Economics. Why are past messages important? In short, blockchain technology (aka crypto system) is like a group WhatsApp. It keeps messages in the past and everyone in the group can see it. In blockchain, the messages hold transactions: Amy gives £10 to Berry. Claudia gives £8 to Daniel. If there is a dispute, you can always go back to the transaction history and confirm it. Now, what if someone edits the messages? That’s a big no-no. So instead, the messages are encrypted through cryptography. Now, no one can edit the messages in the WhatsApp chat. There are various economic incentives. Imagine that there are 3 bridges for you to take. Bridge 1: you have to pay £1 when you use it. Bridge 2: the bridge is made 1000 years ago, a hole in the middle and crocodiles below, eating you if you fall. No one use this bridge in the past 950 years. Bridge 3: a wooden bridge with termites all over, a family of woodpecker pecking on the wood and a very hungry lion is on the other end, waiting to eat anything that moves. The last person who used it was eaten by the lion. You can see his skeletons at the end of the bridge. Which bridge will you choose? You choose bridge 1, of course. It’s safe, and easy to use. That is an important criteria in the design of the crypto-project. Alright, so let’s say everything is good so far. How can we make sure that in 10 years, we will still be using Bridge 1? Imagine you own Bridge 1. If people want to cross the bridge, they have to pay you £1. Will you continue to stay in the bridge business and continue providing the bridge service to people? Well of course, because you are going to be earning money every time people pass. It is the similar in blockchain. If validate a transaction, you get paid in transaction fee. Now, you are incentivised to be part of the network (aka maintain that bridge, clean it, make sure people use it so you can make money) and earn that transaction fee. Next up, ELI5: what constitutes tokenomics. Future reading: tokenomics resource list.